Ibes Guisados (Stewed White Beans) from Campeche. The spices you see is the achiote paste before it became a paste. This soup called for the egg to be poached in the soup at the end of cooking. Anything with an egg on top is good in my book. Tortillas Rellenas en Mojo de Ajo (Tortillas Filled with Shrimp and Fried in Garlic Oil) from Tabasco. This also involved a shrimp filling recipe and a black bean paste recipe (that’s three recipes down in one dish). That is vegan cheddar cheese I substituted for queso fresco. 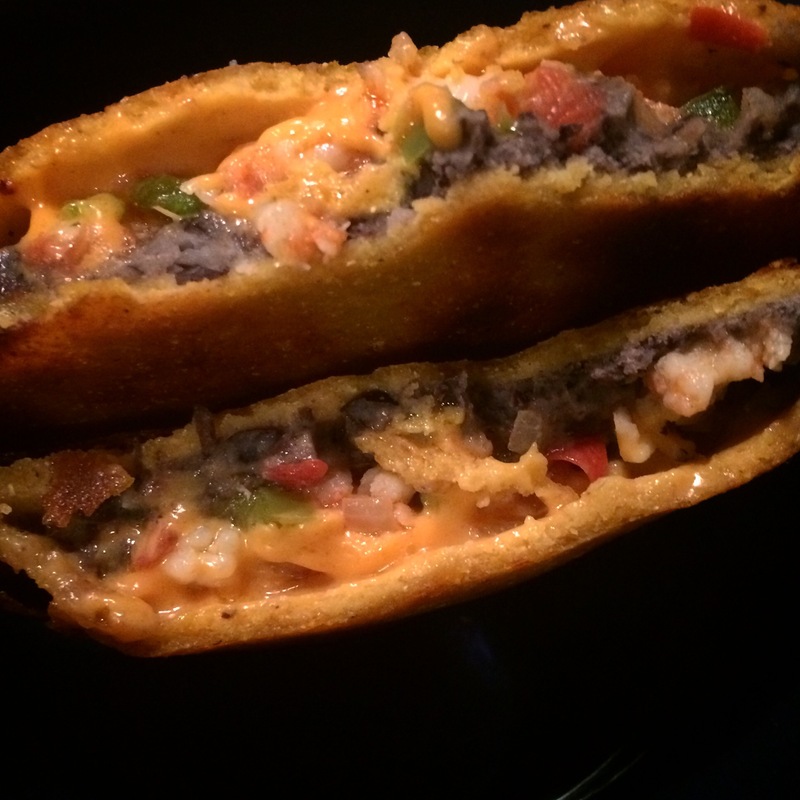 Imagine a fancier, shrimp filled hot pocket. Delicious. 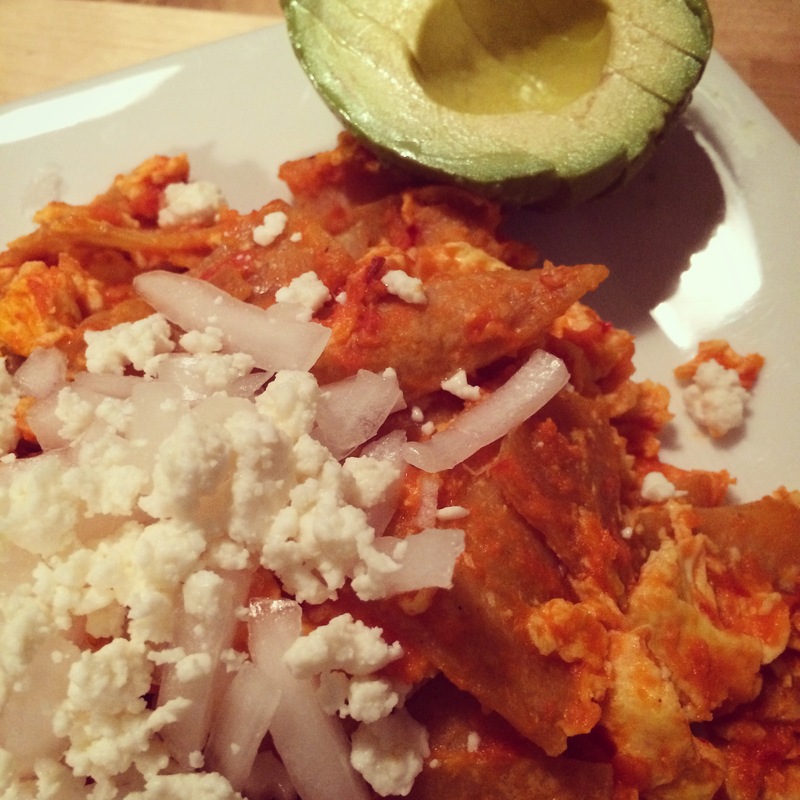 Chilaquiles from Jalisco. This version has the tomato and chili árbol sauce cooked in with the fried tortillas. I wasn’t able to enjoy the queso fresco, but this breakfast dish was exactly what we needed for dinner that night. 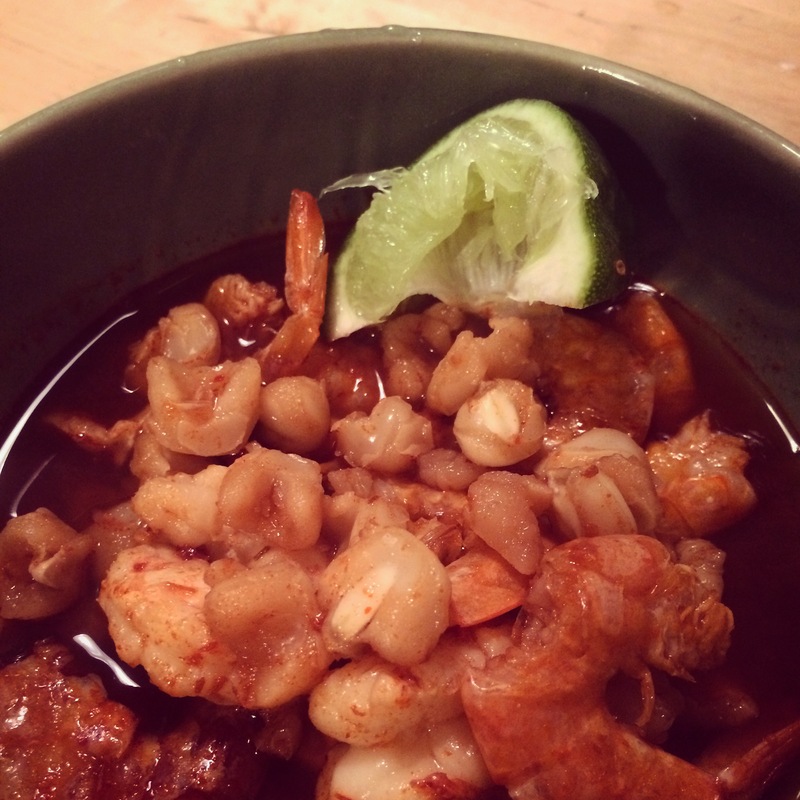 Pozole de Camarón (Shrimp Pozole) from Jalisco. This soup was really fun for me to make. I actually got fresh corn (not hominy already in the can) and cooked the corn fresh. The soup called for fresh shrimp and dried shrimp which added some awesome texture to the soup. The deep red sauce made from ancho and guajillo chiles definitely stained my cutting board and wooden spoons, but it was worth it. Papas Pastoras (Shepard Potatoes) from Zacatecs. I wasn’t able to find the very small new potatoes this recipe called for but I think these mini potatoes worked really well. They were super spicy from the serrano, onion, cilantro and lime sauce. 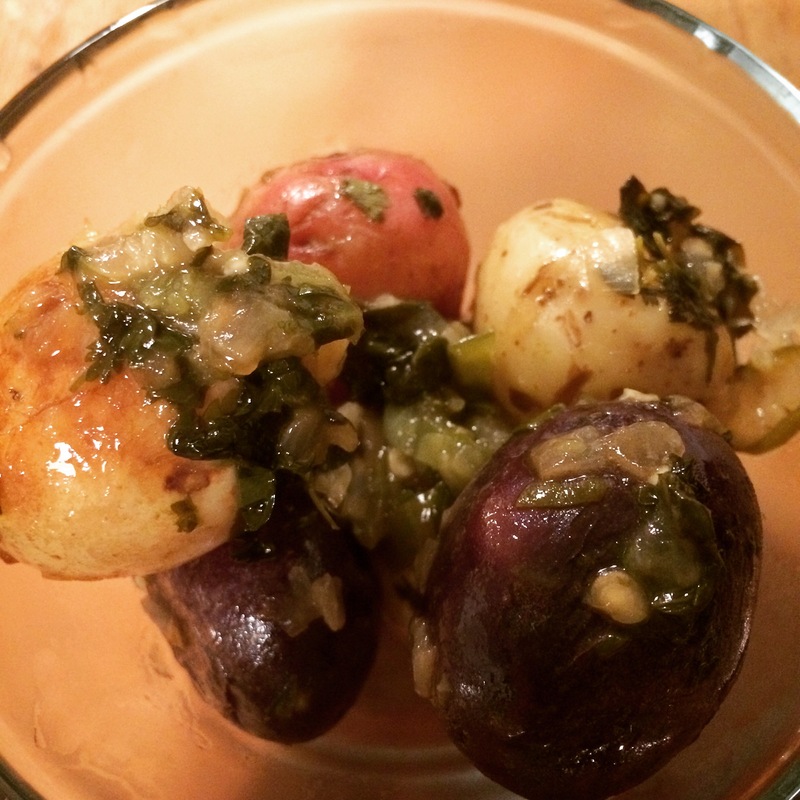 I love potatoes and ate these on their own as a meal but they would work great as a side dish too. Pollo en Salsa de Cacahuate (Chicken in Peanut Sauce) from The Central Hub. This recipe called for a ton of peanuts with the red skins still intact and 16 dried chiles. The flavors were very BBQy and earthy. Mark (my lovely brother-in-law/house guest for the weekend) thought the sauce had an earthy and roasted flavor, making him feel like he was eating steak from the grill instead of chicken. This sauce would be a great sauce for vegetarians or people trying to not eat as much meat. If you put this on veggies it will give you that charcoaled, BBQed flavor you might be missing. 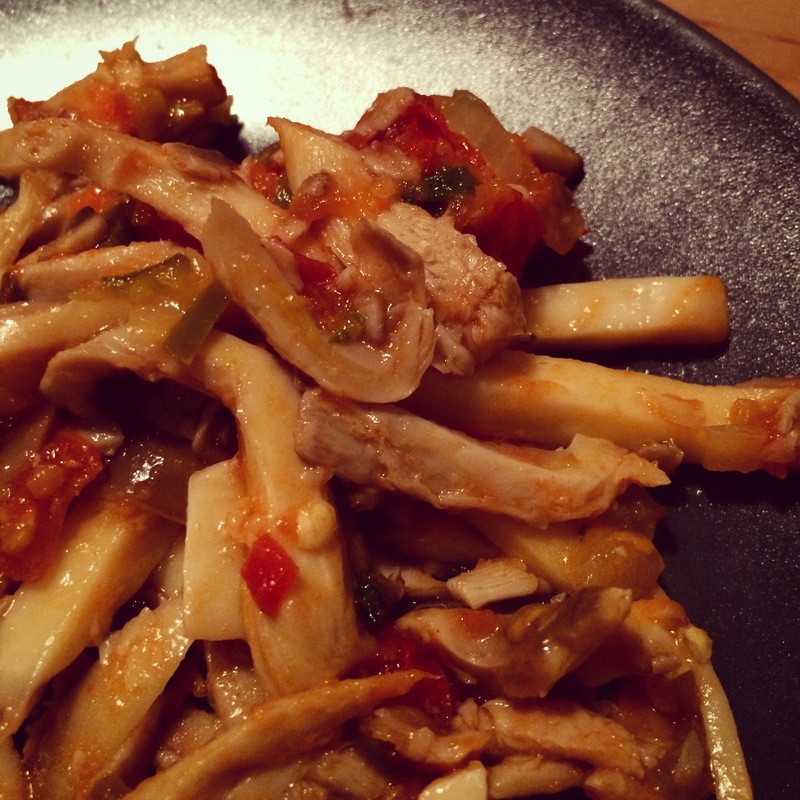 Hongos Guisados con Yerbabuena (Mushrooms Cooked with Mint) from Jalisco. I had intended on cooking a pork dish to go with this mushroom side dish but the pork I had got had spoiled. This dish definitely stood on its own. It called for a ton of wild, oyster or shitake mushrooms. I went for the oyster mushrooms at Whole Foods. The sauce was an oil and vegan butter mixture with a ton of serrano chiles, making it a pretty hot and yummy dish. I will probably be making this one again to accompany future dishes. That pozole de camaron looks so yummy! Never thought to replace shrimp for the pork. You will have to teach me how to cook fresh hominy. All I can say is that mexican dried chiles make anything taste good.